There's a reason that the post-apocalyptic wasteland has always held a special place in gamers' hearts. In a way, it's the ultimate combination of freedom and danger -- a world in which everything is trying to kill you, yet where you have the chance not just to survive but to thrive. I tried to capture this spirit of adventure in the new GURPS After the End series, pitting believable heroes against serious threats for a wide variety of rewards. 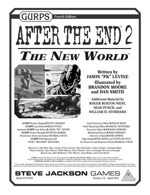 GURPS After the End 2: The New World is your guide to these perils, aimed at both the GM (to threaten the heroes) and the players (to know how to overcome them). But this is more than just a list of things that want you dead! Equal focus is given to common wasteland challenges, from camping and hunting to inventing and repairing gear. Scavenge through ruins, hack ancient computers, attract followers, barter for bullets, and more. The challenges are unlimited, the New World is unique and unexplored, and everything from the Old World is a potential reward. Does gaming get much better than that?